THE HUNT does a gripping, unnerving, frighteningly believable job of painting the layers of paranoia, dread, helplessness and outrage that sleep under normal everyday life, waiting for a false accusation (of something awful) to peel them back and expose you, naked and alone, to the scourging winds of injustice. 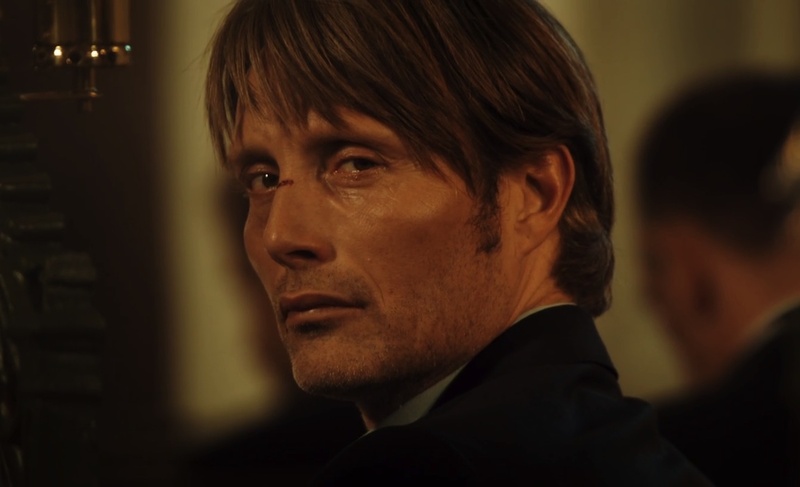 In this 2012 sleeper from Denmark, director Thomas Vinterberg spins a nightmare for star Mads Mikkelsen, as a kindergarten teacher who is accused of molesting one of his charges, who also happens to be the daughter of his best friend. Innuendo snowballs into town-wide ostracization, threats and existential torment. Faultless backing from the supporting players, rich production quality all round (it was Oscar nominated for Best Foreign Film). The little film was a resounding critical success, and did well with audiences, making nearly $17,000,000, a strong return on its small $3,800,000 cost. Chief attribute is the magnetic Mads, who has classic screen presence and ‘star quality’ to burn in every frame of film he graces. With Alexandra Rappaport, Thomas Bo Larsen, Susse Wold, Lars Ranthe, Anne Louise Hassing, Annika Wedderkopp, Lasse Fogelstrom, Ole Dupont.